Many health enthusiasts tend to be skeptical when a well-known company releases an ‘updated’ version of a flagship product, and this includes BSN N.O. Xplode 2.0. As a pre-workout supplement, N.O. Xplode remains one of the most popular products in the world and the 2.0 release has updated the ingredient list as well as changed the dosage on some of the more prized ingredients. This includes a unique blend of B vitamins, caffeine, Taurine, and the sought after nitric oxide. Overall, this supplement will provided users with more focus and intensity when working out as well as increased pumps and vascularity. When combined with a number of decent flavors and a price of around $27 for 2.48 pounds, it ranks among the most cost-effective pre-workout supplements on the market. When it comes to pre and post-workout supplements, few companies have a following as loyal and as enthused as BSN, and this comes for a good reason. The company approaches their customers with a relatively open book policy when it comes to some of the more complex supplements. For N.O. Xplode 2.0 users, this is a welcome relief from the slew of products that hide all of their ingredients behind an infuriating ‘proprietary blend’ labeling. N.O. Xplode 2.0 contains all of the ingredients that bodybuilders, athletes, and health enthusiasts in general have come to love ranging from B12 and B6 to Taurine and a liberal dose of caffeine. Within a few minutes of taking this supplement, typically beginning with one scoop and an 8 oz. glass of water, the effects can be felt. A flush is common as well as a significant boost in energy and focus. This makes it a great option for those that have become lethargic or tired of their workouts and in need of a boost to push them back into the gym. Once the training begins, the muscles will immediately swell for those that are looking to get a great pump and the focus that N.O. Xplode 2.0 provides is nearly unbeatable. While many other competing products only offer that initial surge of energy for the first few sets, this updated N.O. Xplode has effects that last for a relatively long time, often as much as an hour or more of strenuous training. Once out of the gym or done with a training sessions, the stimulants continue to boost one’s metabolism and increase circulation which will serve one important purpose. The mandatory post-training session snack or meal will break down and feed the muscles in a much more efficient manner. Whether it is a quick sandwich or a synthesized protein shake, the ingredients within N.O. Xplode ensure that the body is prepped to receive nutrients when the muscles have essentially gone into a glycemic shock. Over time, this means that athletes and fitness enthusiasts of almost any type will begin seeing the results that they have worked so hard for including better endurance, more definition, and improved strength. When taking a look at the ingredients of the original N.O. Xplode and N.O. Xplode 2.0, it will become readily apparent that the lists are practically identical. There have been some small changes to the active ingredients, but many of the changes have been made to inactive or nearly inactive ingredients. This is both a good and a bad thing, however, as the original blend was the perfect fit for many customers. There also still tends to be some issues with a number of ingredients that are most likely not needed and could cause unwanted side effects such as stomach cramps or a flushed face. For many, this could be the abundance of phosphor which has a negative impact on certain individuals. It also appears as if whatever changes happened to the blend made it slightly more difficult mix up, especially with older batches. Without a shaker bottle, some may find themselves having to spend a little extra time to break apart the clumps for a more consistent drink. Finally, most avid athletes or those used to these common ingredients are going to find that the suggested serving is nowhere near what is needed to feel the full effects of this product. 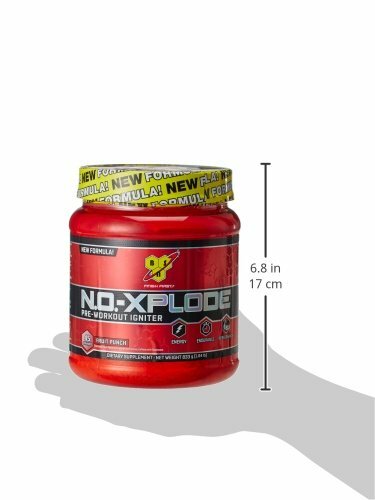 BSN suggests that all users gradually begin with around a full scoop, but the real energy boost is not felt until upwards of 2 to 3 scoops in many cases. This means that smaller jugs such as the 2.48 pound bottle may only last a few weeks which could dramatically increase costs. It is tough to find many things wrong with not only one of the biggest companies in the fitness industry, but also one of the most popular and successful pre-workout supplements that is available today. There are some minor drawbacks, including some unnecessary changes to the ingredients, but this can be overlooked with the results that BSN’s N.O. Xplode 2.0 can produce. For those that are looking for a decent tasting product, it is probably best to steer clear of some of the more unique flavors such as watermelon and stick to standbys such as lemonade, cherry, and fruit punch. When combined with a consistent and effective exercise regimen, users are sure to see results in no time at all.